We're back with a very brief post covering Meghan's appearance in the official portraits of Prince Louis' christening. The images were taken after the service at Clarence House by photographer Matt Holyoak. 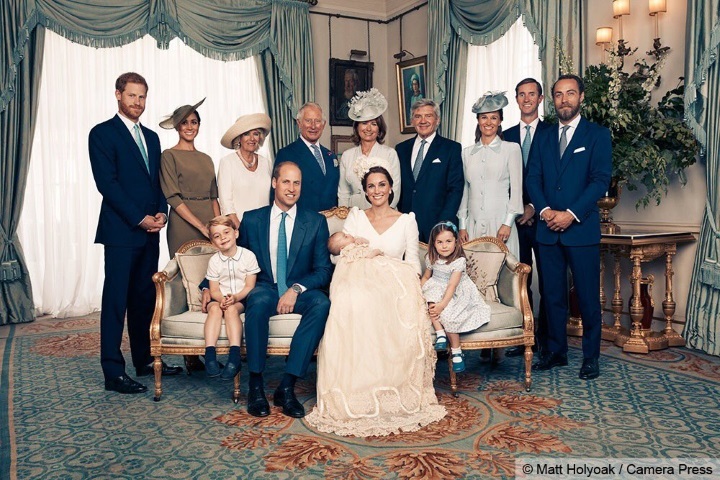 Harry and Meghan also featured in a group photograph with both families. Matt Holyoak said “I was truly honoured at being asked... and to witness at first hand such a happy event. Everyone was so relaxed and in such good spirits, it was an absolute pleasure. I only hope I have captured some of that joy in my photographs." Matt Holyoak is one of the world's leading celebrity portrait photographers. His love of portraiture started at Art College, where he studied to be a fine artist, specialising in contemporary portrait painting and drawing. He then discovered his passion for photography and perfected his craft working in still life, fashion and portraiture; assisting some of the most revered photographers of our times. His photographs have been published internationally in magazines such as Harper’s Bazaar, GQ, Another, Vogue, Dazed and Confused, Elle, Empire, Rolling Stone, Interview, L’Uomo Vogue and Vanity Fair. He has shot campaigns for Adidas, Gilette and Qatar Airways. A number of his pieces have been acquired by the National Portrait Gallery for their permanent collection. 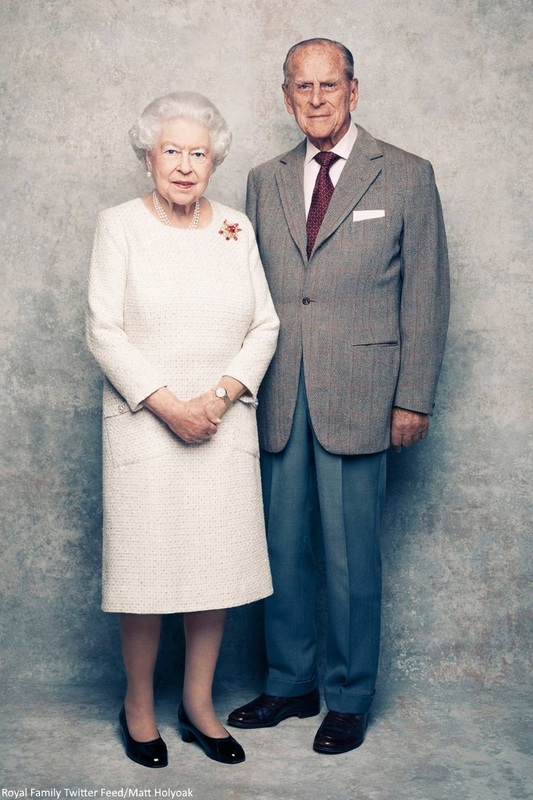 Holyoak took the hugely popular 70th wedding anniversary images of the Queen and Prince Philip. The Duchess wore an olive green Ralph Lauren dress with a matching Stephen Jones hat, Cartier earrings and green accessories for the service. It turned out to be quite the week for Ralph Lauren with Meghan selecting a crisp stripe shirt and wide leg trousers by the American brand for Wimbledon yesterday. On Tuesday, Harry and Meghan will officially open the Nelson Mandela Centenary Exhibition at Southbank Centre's Queen Elizabeth Hall. The exhibition explores the life and times of Mandela. 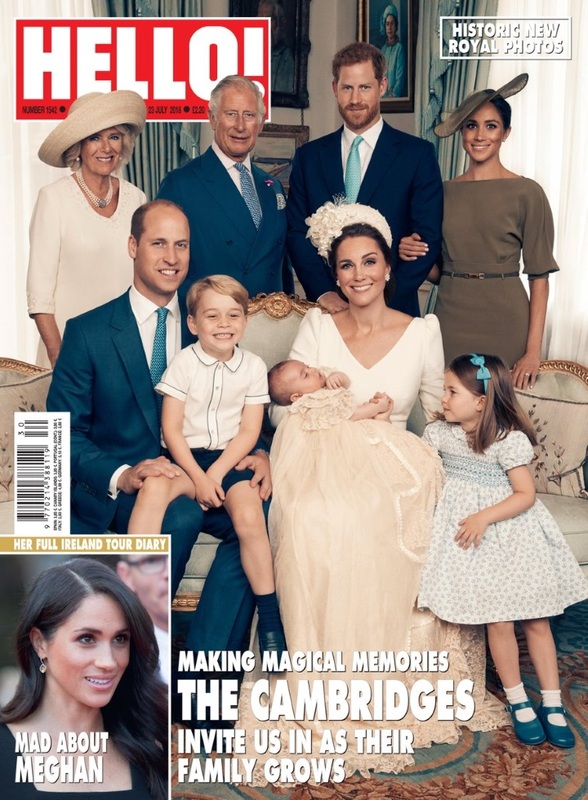 I loved the photos, and I really liked the one with all of the Windsors - the future of the royal family, as it is so accurately stated in the post! Wow, thanks for getting this post up so fast Charlotte, the photos were just released!!! The more I see this outfit on Meghan the more and I like!! And how at ease and happy she looks surrounded by Harry's family and Kate's family, it just makes my heart melt a bit! My only quibble with these photos is that we really don't get a great shot of Louis' face, just a side profile. Nice to see Meghan as she fits into her new family. It is a beautiful family, that's for sure! Beautiful pictures of the family. Best I have seen. You are quite right Becca, the olive green works so well with the room colors and the colors the worn by the other family members. All the photos are indeed great family portraits. I also agree completely, Becca! It is a happy and beautiful family and Meghan looks so happy to be part of it. I imagine Harry is so fulfilled. Charlotte is really really adorable! And I like Kate's hat---a totally different style and it's great. I don’t know if she planned it that way, but it works! Well said. I belong to the Anglican Communion: we have no approved list of colors, so all the jabber about cream/pastels made sense. Babies do get christened in winter. I wouldn’t wear pale blue. The outdoor one with Catherine and her little prince is phenomenal. She is totally smitten with that little boy. I love the extended family photos, they are exquisite. Meghan's dress looks a little browner than in the initial photos. It blends with the cream color of the christening gown wonderfully. I wonder if the photographer did that deliberately? The photos are sensational. I do wish the duchess would not have held Harry's arm. I know they're in love, but the arm holding, especially in staged photos, looks clingy. Her smile is what they call "Mega-watt" - it is lighting up the room! Beautiful photographs! My only quibble is Meghan linking her arm with Harry. It just seems out of place and frankly, unnecessary. I think it's appropriate and it adds a human element to the portrait. They're not robots. I love how Prince George is hamming it up some with his smiles in a few of the photos! Guess it doesn't matter what family you're from, this is what kids do! I LOVE the photo of the 9 of them. There’s something that just screams family to me - I hope they have a copy of this somewhere in their homes. It’s a beautiful photo and should be displayed. 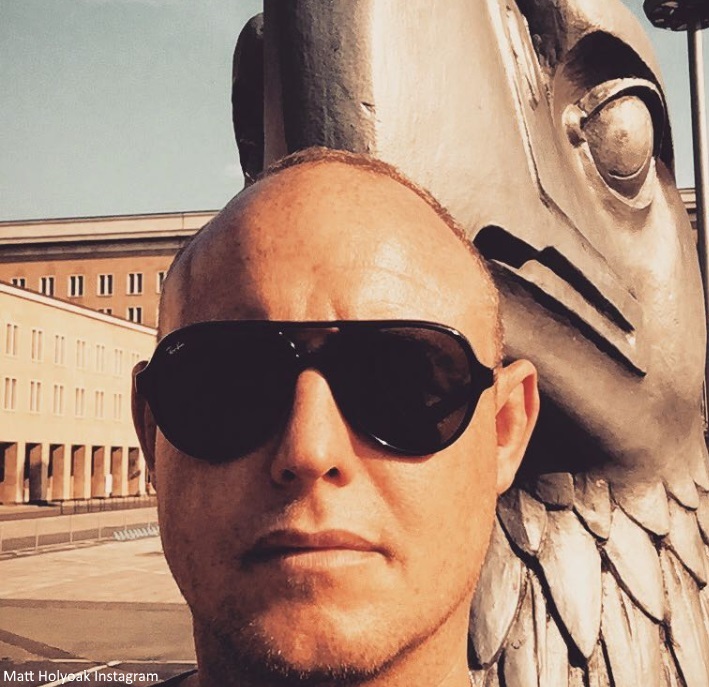 Is that a portrait of Queen Elizabeth in the background? If so, I don’t think it was an accident that it was taken in this location in the room. Even though she wasn’t physically there, she’ll forever be in the photos. Meghan just seems to fit so perfectly in the family - in their interactions and their photos. I will always hold out hope that we’ll get some more personal and fun family photos now that they are all living full time at Kensington Palace (similar to the ski trip or the GQ photos in the yard). I would love photos of Harry & Meghan interacting with the kids - we’ve seen them with other children - i would love to see them with their niece and nephews. Maybe one day. 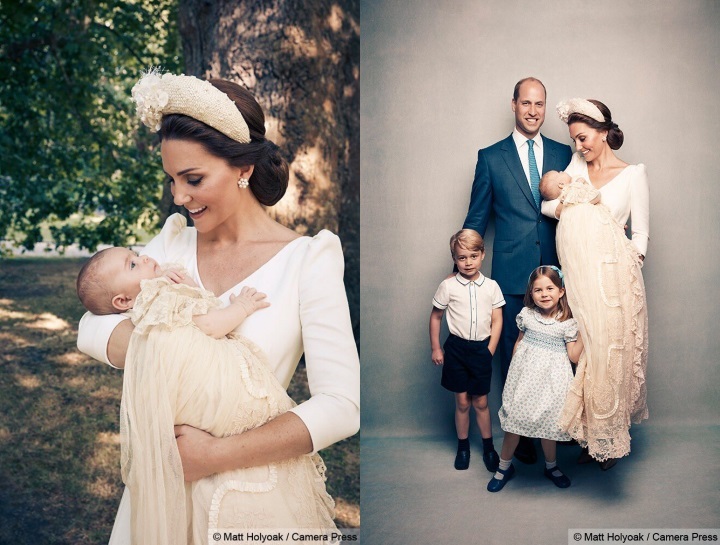 stunning christening shots wow! they all look beautiful. I love Kate's beautiful smile. what a beautiful family! 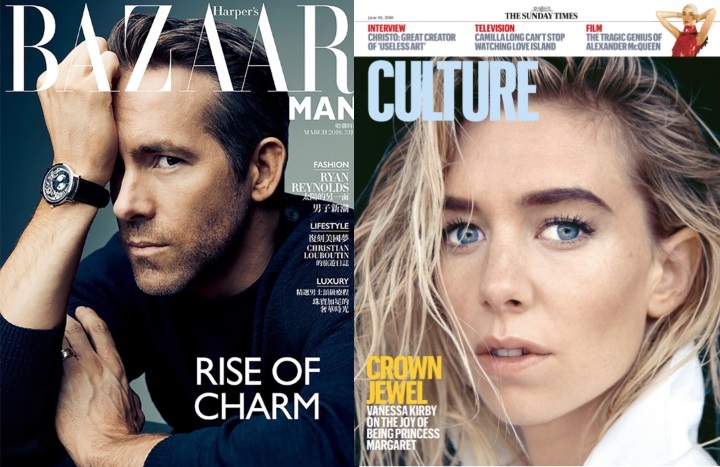 Lovely photos, and Meghan fits in perfectly (and why wouldn´t she? She´s regal in her own right! ;-))) ). I´m glad that George seems to have had so much fun during the shoot!! He does the "CHEEEEEESE!!!" perfectly!!! And little Charlotte holding her little brother´s hand was adorable! Thanks for the quick post!! You had one busy week&weekend!!! Thanks so much for all your work! I don´t know how you do it!! Meghan's dress looks to me almost brown on the Christening photos. No, it really does look brown. Obviously, Meghan walked through a chocolate fountain on her way over to Clarence House from St. James Palace. Becca USA says it so well. We also have to remember that Meghan is not a clone but rather a person who has built a life and is now merged with the RF. Kate's mom and sister align with Kate's style choices, which is understandable, but Meghan brings her own perspectives. All the ensemble photos we have seen with her "shocking" choices of pale pink and deep navy look beautiful. There are a few good commentaries out there about the ridiculous criticism about every aspect of her actions down to how she sits, so at least some in the media "get it." She looks like she is bringing love and unity to a very nice family. As I said, holy photoshop fail! In the first photo they effectively photoshopped Prince William's index finger out of the picture and it looks like he has a stub. Once you see it you can't unsee it. Ivy Lin, if you count his fingers carefully on both hands I believe that what you perceive as a "holy photoshop fail" is his thumb. His left hand pinky finger is obscured by the barely visible ring finger. As for Meghan taking Harry's arm which someone else mentioned, it's "clingy" only if that's how a person is acculturated to perceive it. Why is Charlotte holding Louis's hand more charming than Meghan taking Harry's arm? Each is a gesture of affection and I find both quite charming. George in the shot where he is standing with his hand in his pocket is an uncanny echo of Edward VIII's expression in some old photos. Anyone else notice that? I've been looking at the photo upside down and I still see an incredibly odd cut off stub, as well as one finger missing. Nice comment Philly, I agree. His pinky is under his ring finger, not visible. The fingers are foreshortened because of the angle. If they were going to photoshop anything, why on Earth would they do that? I see all the fingers. William has his finger folded under, that is it. There is no photoshop to see. Just a proud Dad sitting on a sofa having his photo taken with his family. Wonderful photos. Thanks, Charlotte. 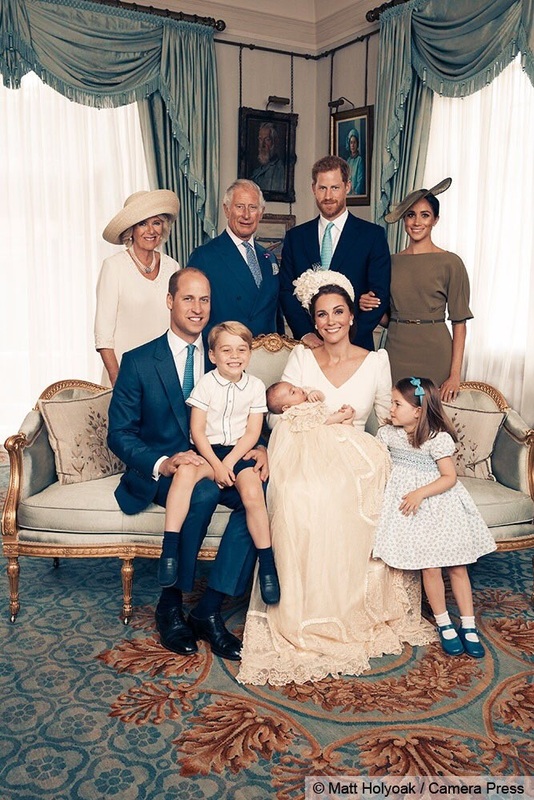 The photo with Prince Louis laughing from ear to ear is a delight. Oh, btw, I saw the photo of Prince Louis smiling ear to ear on the Duchess of Cambridge’s blog. I'm a huge fan of your blog posts and I love the details and history when provided. This is my first time commenting on one of Meagan's outfits and I have to say that her choice for a christening is not a favorite of mine. She appears to be dressed for autumn, rather than a summer baptism. While its a lovely ensemble, just feel it was out of place this time. Love seeing Meghan in the fold of the royal family. After seeing her and Kate at the weekend at Wimbledon, it shows just how close their relationship is, it's a joy to see. I think the arm holding is indeed a sign of affection. Instead of searching for reasons for it, we should search for reasons it would be taboo. MM is affectionate, which I am sure is art of her charm. Lots of things change over the years in the RF---let's say she is starting a new trend, one that will be common in the next generation. As long as Harry looks happy, things should be OK.
Other members of European Royal families don't have this taboo so maybe it is time someone pointed this out to the British Royal family. I thought the christening photos were fabulous!! But as for Wimbledon, Im not a fan of the white pants, they do absolutely nothing for her wonderful figure and that top, why is the waist so weird? im not sure what she's aiming for on that outfit but it misses the mark for me, it seems like most of her outfits are not fitted at the waist and it makes her body look weird to me. she has a great figure and that outfit was just not doing it any good! I really hope it doesn’t come to that! I think he’s full of talk & just wants attention/infamy like his eldest daughter. I’m so over all that family drama & just looking forward to seeing Meghan build a happy & stable life with Harry. I just noticed in the first photo how short Meghan appears next to Harry. Look at where her shoulders come to. Harry is listed as 6'1 and Meghan as 5'7 and she wears those 3 inch heels. She must be closer to 5'6 or not wearing her shoes in this photo. I am guessing the photographer asked her to hold his arm for a composition reason. Wonder how long we will (or won’t) have to wait until she’s pregnant! I've already posted here about how beautiful this event was and thanks to Charlotte for her hard work but I wanted to address the fact that meghan markle's dad went again to the sun newspaper and said more horrible things like meghan is scared and stuff about Harry and how she won't contact him. He's very cruel and obviously not a good father and her step sister is doing celebrity apprentice... it's just sad thankfully meghan was raised with elegance, class and grace by her mother but I really do feel for her and Harry and why her dad just can't let her live in peace. He doesn't truly care for her that's clear he's just getting paid for interviews no wonder she doesn't want to see or trust him! I completely agree Melissa, well said! I hope we get to see Harry and Meghan soon again! I wondered if Charlotte knew about the rumoured Adelaide Cottage that apparently Harry and Meghan had been gifted by the Queen. Is there any truth to that, or just more media hype? The dress does look better in the videos. It appears bulky in the still photos. I think she looks spectacular in cleaner lines like the yellow sheath or the blue dress she wore when she arrived at the hotel with her mom. About her situation with her father, I don't know how she can handle it except for ignoring him. If she says anything to him, he'll just share it with the tabloid media. It really is a shame.